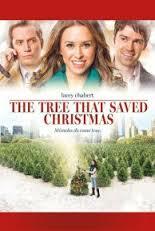 The Tree That Saved Christmas (2014) Rated TV-G | What to Watch. The one thing about this film is that in their promos they hint at the girl having two guys going after her heart. It’s not really two guys but two lives, her country girl side and her city girl side, and which one beats out the other. That’s what is the heart of this film. Do I think it’s a good movie? I wouldn’t say it’s one of the best but it isn’t bad. I just wished that the city guy would have fought for her heart a little more. The brother was another loose end in this film, the character shows up when necessary but seems to be a character on the outskirts unless needed. Other than these loopholes this is a typical Christmas film. This entry was posted in 2014, Christmas Films, Drama, films, Movie reviews, movies, Rated TV-G, reviews and tagged best, brother film, character, chirstmas, christmas film, christmas films, christmas movies, christmas tree farm, city, city guy, Corey Sevier, country, family, film, film reviews, films, girl, guys, heart, hint, home, lacey chabert, lives, Matthew Kevin Anderson, movie, movie reviews, movies, promos, The Tree That Saved Christmas, trailer, Tree that saved christmas, two. Bookmark the permalink.